Excel - When using the Excel file format, a header row containing field names is required. CSV Order Files - When using the CSV file format, a header row should not be included and please use quote delimiters. For clients not using our API to send orders, we offer an order upload process to push orders into the WineDirect Portal for shipment via an Excel spreadsheet: click here for the WineDirect Order Import Excel Template. (last updated 7/18/13). Enter a unique batch ID to identify the orders (i.e. Club_09012013) **please do not use batch names more than once. Character Limit for order numbers is 30 characters (including spaces, dashes & underscores). Select the Account you would like to upload the order, default file format is (Excel (xls & xlsx file types). *Optional: You have the option to use a unique batch name for your Order Batch ID or you can leave it blank (our system will automatically generate a unique Batch ID for your orders if this field is not filled out). Select the file to upload >> proceed to upload your orders by selecting the "Next" button. Download our excel manual spreadsheet. The next screen is a birds eye view of your order details; prior to submission. If the information in the spreadsheet is incomplete, an error will appear on the screen prompting you on what action/s to take to upload your file. Proceed "Submit" button to load your orders. 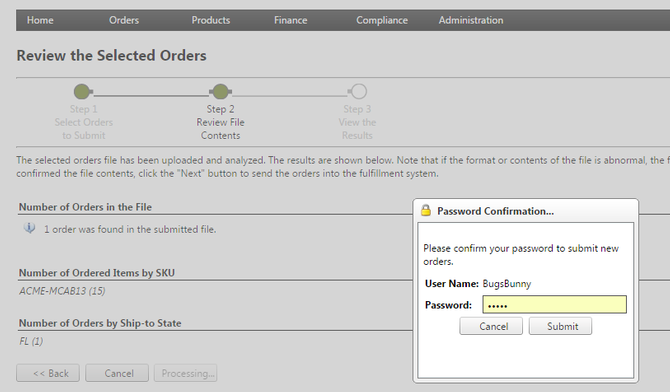 To complete your order submission, a small window will appear for you to confirm your password. Hint: your password is your Fulfillment Portal password. >> "Submit"
You can monitor your order submission thorugh the system by going to Order Batch Summary of our portal. This summary will show any potential issues that occured upon data import.